Home Equestrian Life Is Your Horse College Bound? This was the second most-asked question last year among our friends as talk revolved around our daughter’s upcoming college plans. After we’d gotten past “Where will she go to school?” the next question was inevitably about Arroya, our daughter’s Half-Arabian show mare. I joked that I didn’t know if we could put a horse and a kid through college. We still don’t. But after considering every alternative, we decided to try. Between these two extremes are a world of options and choices. We’ve talked to college students who’ve made those choices, as well as professors and coaches who’ve advised them to give you tips on what to consider when it’s time for college. Students, parents and professors alike emphasize certain common issues you’ll face when deciding what to do with your horse when college bound. They include choosing a school, time management, money and competition. Choosing a school can be a complicated process, and deciding what to do about your horse simply adds another level of complexity. If you plan to ride in college it’s important to choose your school wisely, and make sure you consider more than the equestrian team. Jenny Frye, a hunter rider and currently a graduate student at North Carolina State University in Raleigh, N.C., chose her first school, State University of New York at Stony Brook, based on its equestrian team. Jenny liked SUNY-Stony Brook’s equestrian team, which had a good reputation, and it also accommodated her limited transportation. Jenny didn’t own a horse when she went to college, but considered bringing one that had been offered on loan from her barn back home. She decided against it since she didn’t have a car and was concerned she would not have enough time for a horse of her own with her equestrian activities and school. Although she liked the equestrian competition, Jenny soon realized the school’s academic offerings didn’t mesh with her goals. “That was my biggest mistake, thinking only in terms of the equestrian team and not even looking at what I wanted to major in. I wanted to be a vet, so I decided to transfer to a school that had a good pre-vet program.” By her sophomore year Jenny had transferred to North Carolina State, a much better fit for her. There, she finished her undergraduate work and competed on the equestrian team. Other students are set on a school for one reason or another and make their horse decisions accordingly. Joe Pluhar, a freshman at Texas A&M University in College Station, Texas, and American Quarter Horse Youth Association’s winner in 2005 of the Wrangler Aspire Award, has been showing American Quarter Horses for 11 years in competition all the way up to the AQHYA World Championship Show. Joe knew he wanted to go to Texas A&M for the pre-vet program. To go there, he has given up competitive riding for the time being. He can’t compete on the school’s equestrian team because Texas A&M’s National Collegiate Athletic Association (NCAA) equestrian team is women-only. Nor did he feel he could continue in AQHA competition; even though at A&M he is less than an hour from his trainer, Nancy Cahill, he decided he would not have time to keep a horse with Nancy, compete and go to school. Joe says the school’s excellent equestrian team was still a draw, however. “[It] was something I could be involved in, in terms of maybe helping teach some of the beginner riders, and they also give clinics during the summer to 4-H groups. There are a lot of things I do that are perfectly matched with A&M. I also knew, though, that coming to A&M meant that I wouldn’t be able to show any more.” Joe left his show horses at home for his younger brother and sister to compete on. Most schools (not all) take care of riding and showing expenses. Budgets vary by school. Most teams are women-only to comply with Title IX school funding rules for team sports. Athletes are not allowed to win prize money in competition. Athletes are restricted to a certain number of competitions during the school year, even on their own horses. NCAA schools follow IHSA procedures. Horses from the host school are used in competition; riders draw their mounts randomly and have no warm up before entering the ring. Note: There have been some changes to NCAA equestrian in recent years. For up-to-date info, visit the National Collegiate Equestrian Association at collegiateequestrian.com. Support varies from no expenses covered to most or all covered in varsity programs. The best financial arrangements are usually found at small private colleges, especially those with riding majors. No exclusion for male versus female riders. No restrictions on prize money earnings or number of competitions outside of IHSA. Horses from the host school are used in competition at IHSA shows; riders draw horses randomly and have no warm up before entering the ring. Some schools also put on local shows that are not on the IHSA circuit, in which students may use their own horses or school horses. Concerns about time management are shared by students, parents and school administrators. Professor Suzanne Coen, associate dean of Equine Studies at Lake Erie College in Painesville, Ohio, says she discourages first semester freshmen from bringing their horses with them. Professor Coen explains, “One of the things that I tell parents is that the first year or the first semester of college the students shouldn’t bring their horses if they don’t have to.” College is such a dramatic lifestyle change—students often need time to settle in before bringing their horses to live with them, she says. Texas A&M equestrian head coach Tana Rawson agrees. She explains that only 10 to 15 of their 70 riders bring horses. “A lot of girls decide the time commitment is too much for them. Those that can manage their time can do it,” coach Rawson says. In addition to her classes, studying, six hours per week practice for the equestrian team and another three to four hours in required weight training, Casey also had the occasional tutoring session. Although the boarding barn was only five minutes from the practice facility, Casey says it was often hard to juggle her time and tend to her mare on a regular schedule. She warns, “Give yourself enough time, because I’d be coming home from equestrian team, and be like wow, the dining hall closes in an hour and a half, and I haven’t seen my horse today.” Casey’s advice is to estimate how much time you think you’ll need for everything, and then double it. Amanda Corns, a hunter and dressage rider who shows her American Quarter Horse Ready to Rumble on her local hunter circuit, has worked out another way of managing her time with her horse. Amanda, a senior at Wilmington College in Wilmington, Ohio, who is majoring in communications, did not bring her horse the first semester because she knew college would be, as she puts it, “an absolutely huge adjustment for me.” She leased a school horse her first semester, then brought her horse to school her sophomore year. Amanda has a method that works well for her. She takes a heavy load of classes in the fall and really concentrates on her studies, leaving her horse at home. In the spring she brings “Rumby” to school and takes a lighter load, so she can focus on him. “It really works out great because I get the entire fall semester off, and then all spring semester I can get him back up into show shape for the summer,” Amanda says. If you’re set on bringing a horse to college, you’ll need to check out the boarding facilities at or near the school. You’ll want to know the cost, of course, but it’s also important to know what the policies are for boarding. Some schools don’t have boarding programs on campus, but if it’s a horsey area you can almost always find barns nearby. Other schools offer boarding as part of their programs. At many colleges you can choose either full board or partial board, where you do some of the work. When you’re looking at boarding on campus, ask about the school’s policy regarding your horse. Some schools don’t allow a student’s horse to be used in lessons (even if the owner is riding), while others permit or even require it. The University of Findlay in Findlay, Ohio, for example, allows students to board on campus only while they are using their own horse in the program; horses must be pre-approved by the instructors. Once the students are past the portion of their instruction where they can use their own horses, they must find boarding off campus. If your horse is coming from a backyard barn where you haven’t been paying for board, you’ll need to factor in the costs of keeping him at school. These costs can vary widely. At Fresno State University in Fresno, Calif., students have the option of a “mare motel” for $190 per month, which does not include stall cleaning, or the main barn where stall cleaning is included in the price for $250 per month. 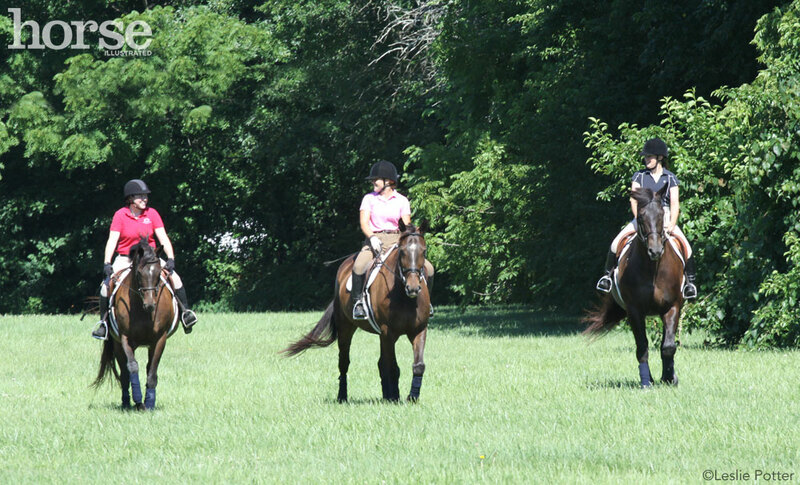 Indoor and outdoor arenas are available for riding when they’re not in use by the school. Lake Erie College charges $435 per month for full board not including turnout, and $350 per month for partial board. Partial board includes feeding, but no stall cleaning. Murray State University, in Murray, Ky., offers board for $300 per semester, with the student fully responsible for all horse care and stall cleaning. If on-campus boarding is too expensive or not available, you’ll probably be able to find alternatives near your school. Professor Coen explains off-campus private boarding often offers a less-expensive option to Lake Erie College’s students. “Some of them might board here their freshman year and then make other arrangements because it’s financially more feasible for them,” she says. On the plus side, students and professors alike say being near horses, whether your own or school horses, can be relaxing for college students. Professor Coen says, “It’s an outlet; it gets students away from campus and the stress of book learning. It gets them out where they can get physical exercise, which I think is extremely important.” She has observed that Lake Erie College’s boarding barn on campus offers a haven, even for students who don’t ride there, as they often come out just to be near the horses, groom them or walk them. If you’re set on continuing your horsey life at school, remember there are lots of options available. Do your homework on schools, set a budget for time and money, and get creative. As long as you can balance hitting the books with hitting the trail, you and your horse should do just fine in college. Ange Dickson Finn is a horse show mom and freelance writer in Houston, Texas. She is the author of The In-Gate: A Parent’s Guide to Horse Shows. Good tips about what to do w/ your horse. This is shows great tips. I’m leaving in a couple years and just bought my first horse. I didn’t know what to do or where to start. Now I have pretty good idea. Make sure to vote for Oberon and Thumbelina!! They deserve to win HOTD!